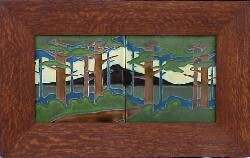 One of the more popular Grueby Tile designs was "The Pines" c1906. Motawi Tileworks has created a similar scene using 8" tile combinations with the same color palette of the originals. Due to the size of the framed tile sets, they ship 'oversize' requiring an additional charge.